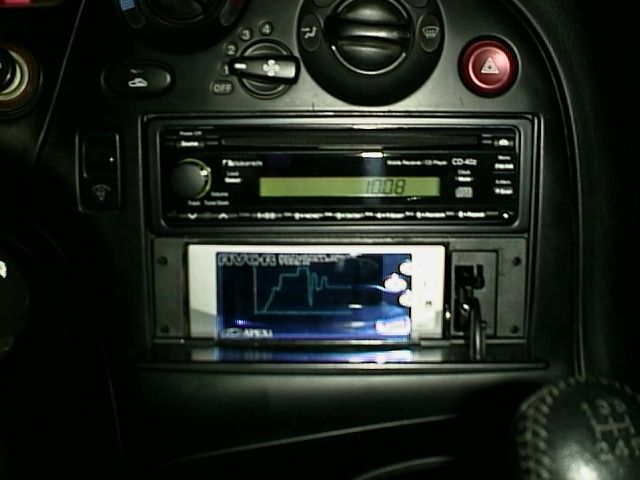 I decided to replace my stock head unit with a Nakamichi CD-40z CD receiver. That decision was due mostly to my wanting to install the display of my A'PEXi AVC-R boost controller in the other DIN slot. 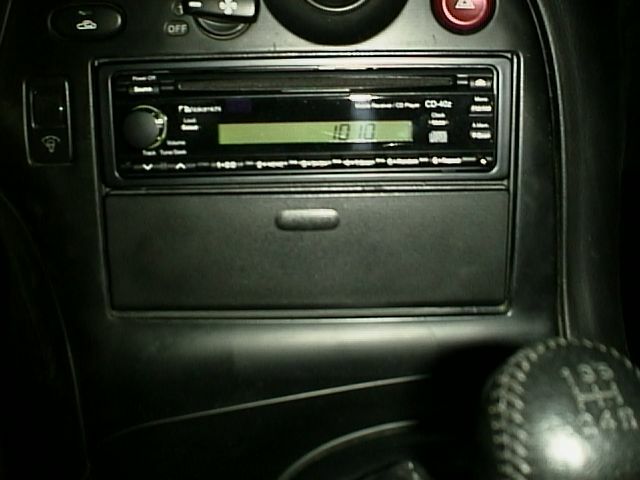 Previously, I had the stock main unit plus the stock CD player; a setup that takes both DIN slots. I purchased a stock DIN "pocket" from someone used, because it has a fold-down cover that I wanted to use to cover up the AVC-R when I wasn't playing with it. I really, really like the understated look of the Nakamichi head unit. It is incredibly difficult to find a nice, understated design like that. With very few exceptions, car stereos look like carnival rides -- all kinds of bright colors and weird control gizmos. I requested one with an amber display, but I got a good deal on the unit from http://www.ubid.com/ and figured that I should just keep the one they sent me rather than deal with returning it and getting a new one. The Nakamichi receivers come in green or amber, but it is not switchable -- you have to order the color you want. It still looks nice and I don't know how well the amber would have matched anyway. I was hoping the green would match the color of the SPA gauges, as I will soon have two in the dash to replace the stock WT and OP gauges, but it doesn't match that well. 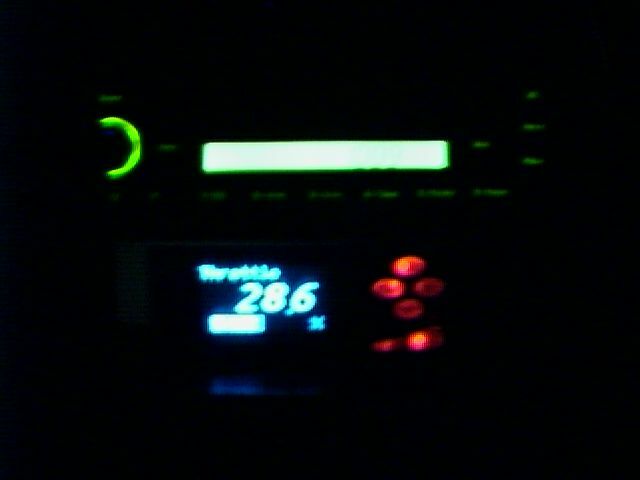 The head unit seems to function reasonably well and does not skip very easily even in my rough-riding car. In all honesty, it sounds a little harsh, and the system sounded better with high frequencies coming only from the front speakers as the stock head unit runs things. But it does sound a little cleaner when I crank it up. If I was to do this again, I might spring for the CD-45z, which has a better A/D section, in hopes that it would be a little smoother and easier on the ears. Or maybe I should just get different speakers. Oh well, it looks great, sounds okay, and only takes up one DIN slot, so I am keeping it. It was very easy to install once I got a harness to connect to the stock wiring from a local stereo shop. You can use the rubber finger thing from the back of the stock stereo, and the sleeve fits perfectly in the stock opening. The trim ring takes up the rest of the space and the install turns out looking very good. I cut up the pocket to hold the AVC-R. It fits quite well in the open part of the pocket. So well, in fact, that I had to cut the back cover of the AVC-R so the cord would fit. The tight fit is nice because you don't have to create any extra panels or anything. I didn't do that careful a job on it, but it still turned out pretty decent. I can always close the cover to hide the less than perfect craftsmanship. I used a cutting wheel in my Dremel tool to do the cutting. To fit it into the DIN slot, I also had the increase the height of the DIN slot opening just a tad. It just took a few minutes with a file to make the necessary changes. The display is held in pretty securely without using glue or tape or anything. I was kind of expecting to get some light shining out from the edges with the pocket door closed at night, but to my surprise and delight, you can't see any light with the door closed. Perfect! With the door open, the AVC-R actually looks pretty good at night. The blue display is a new color, but the amber buttons are a very close match to the stock dash lighting. During the day, of course, the silver and blue look totally out of place. I am just getting started with the AVC-R, but the monitor functions are pretty cool. You can show boost, RPM, vehicle speed, throttle position, boost control solenoid duty cycle, and injector duty cycle. It does digital monitoring of up to three values, a graphical representation of a graduated analog gauge for one or two values, or real-time graphs of up to three values (with no units displayed). It also allows you to freeze and do peak-hold. It should be pretty useful for boost tuning. The unit also does some pretty advanced boost control, including curves based on RPM, or different boost for different gears. Sorry for the lousy pictures, but if you have been browsing my site at all you'll know photography isn't my finest skill.